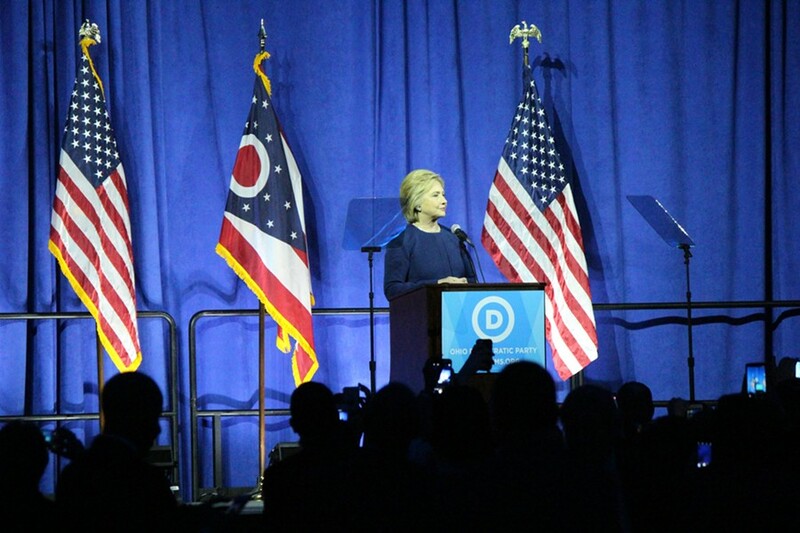 Hillary Clinton addresses Ohio Democrats Sunday night in Columbus. As he welcomed Sen. Bernie Sanders (I-Vt.) and former secretary of state Hillary Clinton to Ohio on Sunday, Sen. Sherrod Brown (D-Ohio) made clear where he thinks his home state ranks in the political pecking order. "Welcome to the most important state in the union this Tuesday," he told 3,300 Democratic activists and officials gathered at the Greater Columbus Convention Center for an Ohio Democratic Party dinner. "And the most important state in the union on the first Tuesday after the first Monday in November." Brown may have been exaggerating, but he had a point. Though Florida and Illinois will dole out more Democratic delegates in Tuesday's five primaries, Ohio's status as a Midwestern bellwether — and a must-win general election state — could make it the biggest prize of the week. Fearing a repeat of Sanders' come-from-behind victory in Michigan last week — fueled, in part, by a protectionist message that has found resonance in the Rust Belt — Clinton and her allies have been laboring to convince Ohioans that she is no free-trade zealot. "I trust Hillary Clinton on trade and manufacturing," Brown said as he introduced her in Columbus. "I trust her on this because I know what she will do: fight for American jobs with a different trade policy, different tax policy and a different manufacturing policy." In her own remarks, Clinton appeared to acknowledge the damage Sanders had done by tying her to the North American Free Trade Agreement, which her husband signed into law in 1993, and the Trans-Pacific Partnership, which she supported as secretary of state and which she now opposes. Sanders has been airing a tough television advertisement in Ohio noting that "other" candidates "supported unfair trade deals." "I want to be very clear. I know there's been a lot of discussion in the last week or so about trade — and I'd like to take the opportunity tonight to set the record straight," Clinton said. "To every worker in Ohio and every worker across America, let me say this: If I am fortunate enough to be your president, I will stand with you and I will have your back and I will stop dead in its tracks any trade deal that hurts America and American workers." At the same time, Clinton sought to distinguish herself from "people who oppose all trade deals," a clear reference to Sanders. "I think we need a president who is not just opposed to trade," she said. "We need a president who knows how to compete against the rest of the world and win — win for America and win for American workers." Clinton and Sanders spoke to the Ohio Democrats shortly before making back-to-back appearances at a nearby live CNN forum. Sanders arrived late to the dinner and had to leave early, because he was up first at the forum, so his remarks were uncharacteristically brief. He drew the loudest applause when he addressed his opposition to free trade and argued for raising the minimum wage and providing universal health insurance. Perhaps recognizing that this was a pro-Clinton crowd, he refrained from mentioning his opponent by name. "Maybe, just maybe, it's time to end our disastrous trade policies," Sanders said, listing NAFTA, the Central America Free Trade Agreement and permanent normal trade relations with China. "And tell corporate America that they better start investing in this country — not just in China." 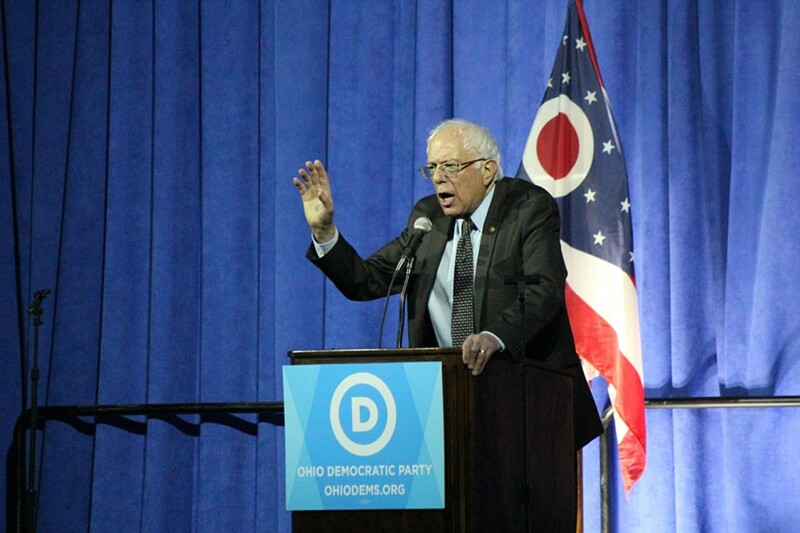 Sen. Bernie Sanders addresses Ohio Democrats Sunday night in Columbus. Outside the ballroom, Marcia Oganowski, a self-employed computer support technician from Batavia, remarked on Clinton's new attention to trade. "I think somebody got her attention," she said. "And I think she seems to be communicating that she may be rethinking this." Oganowski was sporting a Clinton sticker, but she said she was still deciding between the two candidates. "I love Bernie Sanders' message. He is the true American," she said. "She probably is the most qualified human being on the face of the Earth to be president." Libby Kalbouss, a longtime party volunteer from Columbus, said that she was firmly behind Clinton, citing the former secretary of state's experience, connections, intelligence and gender. "It's time for a woman to be president," she said. But according to Kalbouss, not everybody in her family felt the same. "Our grandchildren — we have two in college, one in high school — and they are [with] Bernie," she said. "They are feelin' the Bern."